I’ve never really used my iPod to watch a ton of videos, especially not within my house. However, not everyone spends as much of their time at their computer as I tend to. If you have an area of the house you’d like to more comfortably watch videos on your Nano, this little TV would definitely help you out. It’d be great for hiding out in the garage or a small closet when your in-laws are in town. 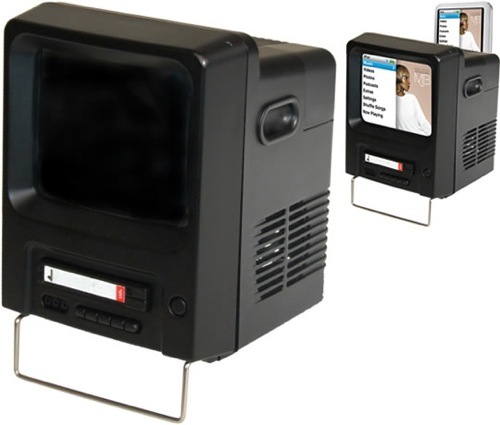 It looks like the classic TV/VCR combination, but it actually plays videos directly from your Nano. It does this by magnifying the screen on your Nano by up to 2.8in. Then it plays the sound through the TV speakers. Which also means you could hear your music without having to keep your headphones on the whole time. The TV sadly only works for those with 3rd generation Nanos, so the newer Nanos are out of luck. However, for those with the 3rd gens you can pick this up for pretty cheap. It’s being sold for £14.99 or about $23. where can i get one!?! ?